Nicola was brought up in Maidenhead and qualified from Bristol University in 2003. Following an SHO post in Oral and Maxillofacial Surgery in Cambridge she returned to Berkshire and General Practice in 2005. She is a Member of the Faculty of Dental Surgery and Fellow of the Faculty of General Dental Practice of the Royal College of Surgeons of England. In 2014 she was awarded an MSc in Restorative Dentistry from the University of Leeds with distinction. 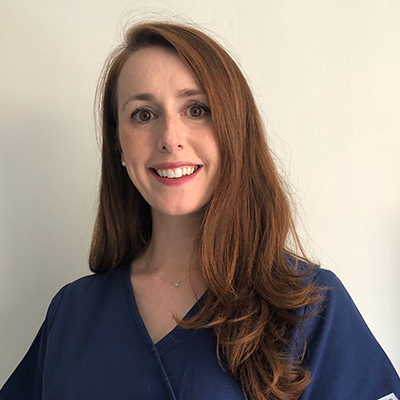 Nicola has been an examiner for the Royal College of Surgeons MJDF qualification and has taught undergraduate students at the University of Bristol as a Clinical Teaching Fellow. She currently sits on Berkshire Local Dental Committee and appraises dentists throughout the Thames Valley for Health Education England. She has a caring and holistic approach to dentistry and likes treating patients of all ages, especially those who may be apprehensive of dental treatment! Although enjoying all aspects of General Practice her particular interests are the treatment of tooth wear, cosmetic treatments including dental bleaching and tooth coloured dental restorations and the treatment of periodontal (gum) disease. Outside of dentistry Nicola enjoys cookery, clay pigeon shooting and spending time in the countryside with her husband, son and dog.